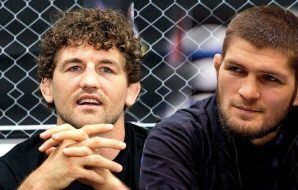 Here, in this article, you’ll find out information on where Khabib Nurmagomedov trains, who are his coaches, training partners and managers. 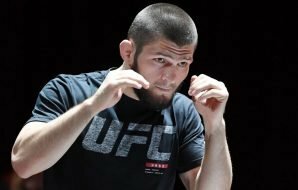 Khabib trains either in Russia in his hometown Makhachkala or in the US at the American Kickboxing Academy (AKA) in San Jose. According to Khabib, at home, he mostly works on physical conditions and wrestling, at the AKA gym – on stand up and grappling. 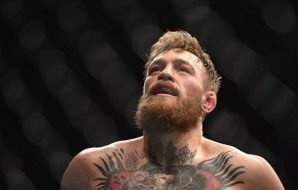 Between the fights, he usually spends about a month and a half or two months at home working on physical conditions and strength. With his father, they do training camp in the Caucasus mountains at higher altitudes. This outdoors training in the mountains is the reason why Khabib has such a great cardio. He also trains at home during the holy month of Ramadan while he fasts (Khabib is very religious). 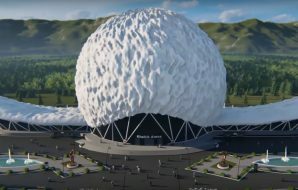 During that time, he has two training sessions a day – one in the evening before the sunset and the second one during the night before sunrise. 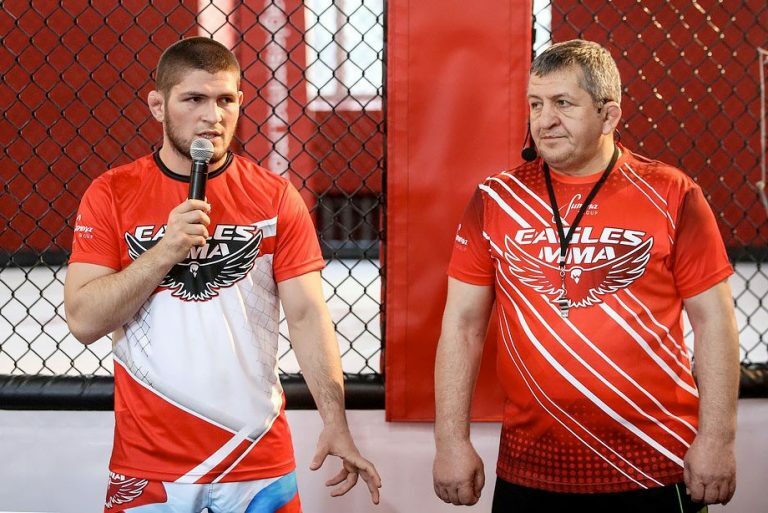 At home, he is coached by his father Abdulmanap Nurmagomedov. Khabib’s father has more than 20 World champions in combat sambo (Khabib itself is a two-time champion). Abdulmanap is considered to be a father of MMA in Dagestan (he already has 4 of his fighters in the UFC today) and he is the reason why Khabib is dominating UFC Lightweight division. Abdulmanap has been having problems with getting the US visa so he doesn’t go with Khabib to the US (he can’t even go to Khabib’s fights and most likely he won’t be able to be in Vegas on October 6). 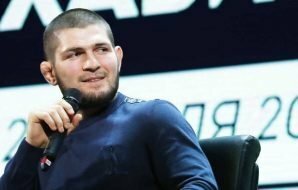 Nurmagomedov-coach is also Khabib’s nutritionist and according to Khabib, he has a hard time preparing for weight-ins without his father. Javier Mendez is Khabib’s second coach. Javier is an owner and founder of the AKA gym in San Jose, California which is considered to be one of the best professional MMA schools in the world. 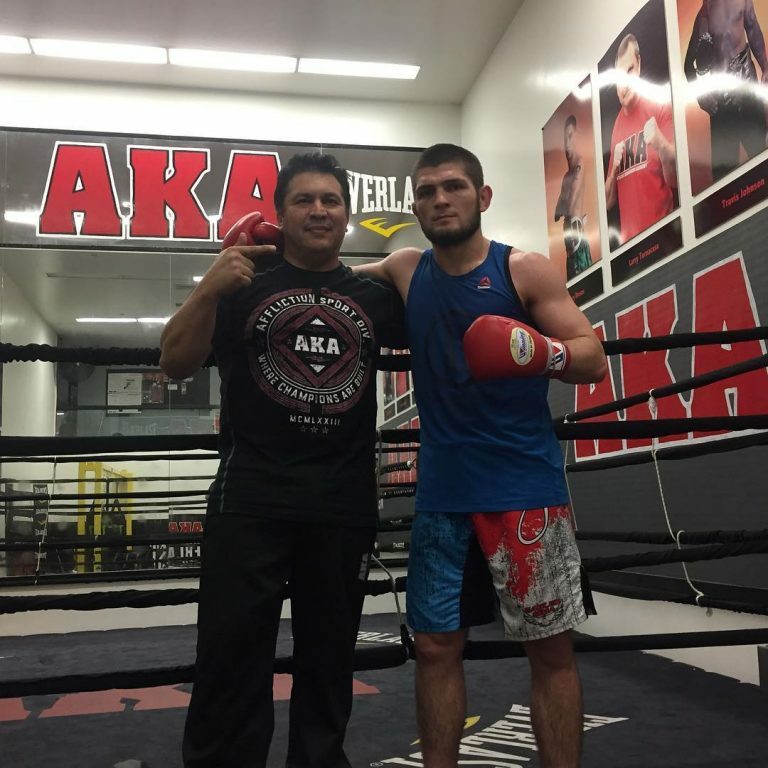 Nurmagomedov started working with Mendez back in 2012 and he has been doing training camps at the AKA since then. 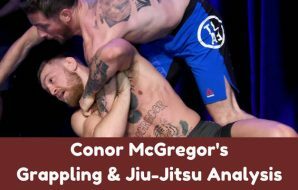 Khabib mostly works with Mendez on striking and grappling techniques. Right now, Mendez is also working with Khabib’s teammates and brothers from his club “Eagles MMA”: Abubakar Nurmagomedov, Omar Nurmagomedov, Zubaira Tukhugov, Islam Makhachev and Islam Mamedov. 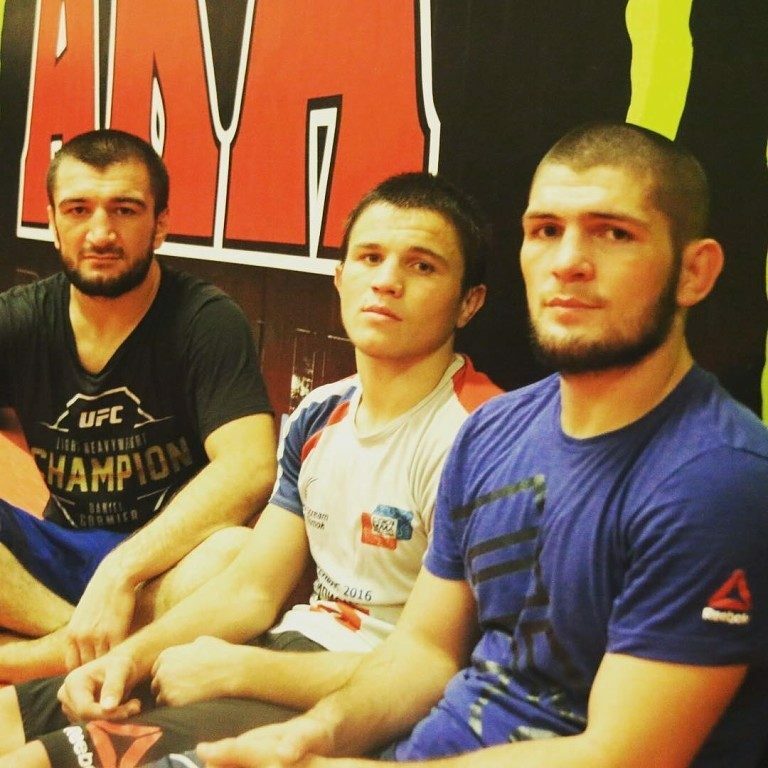 All these guys travel around and train together with Khabib as a group. Abubakar is Khabib’s cousin, he is just a little bit younger than Khabib and they’ve been training together since childhood. Abubakar is currently fighting in the PFL league division and he plans eventually to sign a contract with the UFC (his professional MMA record is 15-2). 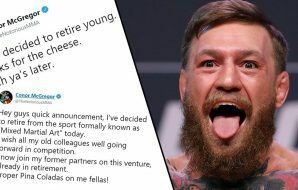 He and Khabib are very close, they always help and support each other. Abubakar is the one who called the ambulance when Khabib’s body give up before weight-ins prior to a fight with Tony Ferguson. Islam Mamedov is Khabib’s training partner for over 10 years. Like Abubakar, he is currently fighting in the PFL but in the Lightweight division. He has a professional MMA record 15-2; 14-0 since 2010. Mamedov hasn’t competed in UFC yet but according to Khabib, Islam is a very strong training partner. Islam Makhachev is a combat sambo World champion and the #22 in the UFC Lightweight division rating with 16-1 pro record. So far 2018 was very successful for Islam Makhachev; he won both of his fights in the 1st round – via punches against Gleison Tibau and armbar against Kajan Johnson at UFC on Fox 30. Tukhugov fights in the lighter than Khabib Featherweight division but they still practice a lot because Zubaira is more of a striker than a wrestler. 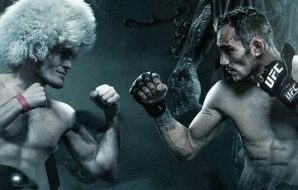 Tukhugov has a 3-1 record in the UFC; he last fought at UFC 198 on May 14, 2016 (he lost a split decision to Renato Moicano). Since then, Zubaira was suspended by USADA for 2 years after one of the drug tests showed positive for ostarine (anabolic agents class). Zubaira Tukhugov will be back in the Octagon on October 27 and will fight Conor McGregor’s buddy Artem Lobov. Omar is Khabib’s younger cousin, he is only 22 at the moment. 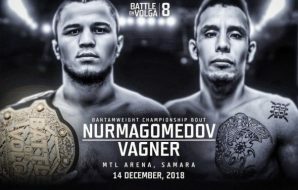 Despite being so young, Nurmagomedov Junior already has a lot of experience – he won 7 professional MMA fights while being undefeated just like his older brother. Omar is a Russian Muay Thai champion and he has a very good striking. Khabib helps his younger cousin with the ground game. It’s safe to say that it won’t be very long until we see Omar Nurmagomedov’s debut in the UFC. According to Khabib, Omar has a very bright future ahead of him. The former UFC Middleweight champion trains at the AKA with Javier Mendez since 2006. Rockhold has very strong ground game skills and often practices with Khabib. DC is also has sparring sessions with Khabib when he comes to train in California. Khabib fights at 155 lb and he is a lot smaller than Cormier who is the UFC Light Heavyweight Champion. Despite that, Khabib is a serious opponent for Cormier at practice. And keep in mind Cormier is one of the best UFC fighters on the ground. Okanovich fights at 155 lb. 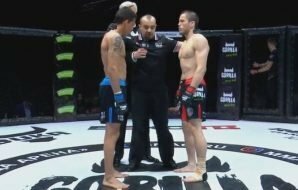 just like Khabib and they sparring together at the AKA gym; he is currently signed with Bellator where he has a 4:1 record. Rizvan Magomedov and Ali Abdelaziz are partners in their agency (they currently have contracts with about 80 MMA fighters). They started working with Khabib after his fight with Rafael Dos Anjos in 2014 when he had a few serious injuries and they helped him to get through these rough times. Ali Abdelaziz is very well-known in the MMA world and he is the manager that gets the best possible contracts for his clients. 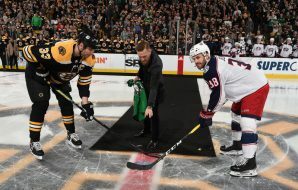 It doesn’t come as a surprise that they got a great deal with McGregor fight.